More bears lining up. They are very quick to knit but take a while to sew up properly. I leave an end each time I change colour and use the tail for that colour's seams. The pink which is not as light or bright as camera shows, is some Patons Smoothie. I have some red of the same and will do a couple plain red ones. I'm not seeing my friend for a while, so if I can consistently manage one a day till then, there should be a nice bagfull for him to pass on. Those done in a single colour are much quicker to seam and have far fewer ends to deal with, making the job much quicker overall. See the difference a needle size makes? The two all pink bears are knitted on different needles but same pattern, yarn and number of stitches. The larger is done on 4 mm, the smaller 3.5 mm. 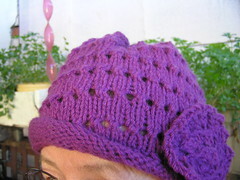 Here's a hat to add to my Winterwarm stash. 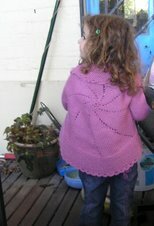 It's done in leftover Heirloom Easycare 8 ply from the ballet cardigan which has been done a few days now. I blocked the left front when it was finished but haven't blocked any of the rest of it yet. Perhaps that will be done next week. I'm a bit over it right now but can't leave it too long or I'll find her birthday is upon me and I have a real deadline to meet. The hat is basically a spinoff from the Pink pinwheel jacket shown in side bar photo. I've used the same principle to make a couple of berets. Keep increasing till slouchy enough, do a purl row, decrease sharply till usual number of stitches for a beret of that thickness and then do ribbed band. However, as this was for a small child in a very cold climate, I've turned it into a hat. Increases till size and proportion looked OK, then maintain the pattern with a YO increase and a knit 2 together decrease. That keeps static number of stitches going down head and also gives the spiral shape. I made up size, just did what looked fine. It will fit some small child and be warm. After all, that's what I made it for. Another little toy for St John Ambulance. This little mouse comes fro Ysolda's Whimsical Little Knits collection. Lots of little projects there. She has other toys too, but not in that collection. The colours have turned out reasonably well. I often have problems with such tones, but these are passable. If I made another mouse, I think I would reduce the size of the ears just a bit. They are supposed to make her look "alert" but I would prefer them a bit smaller. They are knitted with gradual increases and the main colour backing is done the same way, but a couple of stitches bigger all over. When finished, the ear edges are then stitched together and the increased size on the back rolls over the front contrast. The mouse is knitted from the tail up. I-cord is started, done to length required for tale and increases from three stitches then make enough stitches to use three dpns. Because the whole thing is done in the round, the stuffing is added a bit at a time and held down with a spare finger while knitting is continuing. This actually isn't as awkward to do as it sounds, but it seemed quite odd at first. Then the decreases at the head end make it easier for the stuffing to stay in place until the nose is closed off with the thread being run around the last few stitches to make a point. Contrast colour was stitched on later. Miss Mousie was an easy knit, but took quite a bit longer to do than the Burundi Bears. She also needed me to pay attention to increases/decreases for shaping. The title for this entry comes from an old children's song, A frog he would a-wooing go which can be found here. Scroll down to page 3 to read the dire tale of the wedding of Miss Mousie and the frog. My grandchildren all loved this to be sung to them when they were small and I can remember singing it myself when listening to an ABC children's programme.. They used to cover their ears at first when hearing about the end of the story, but gradually became brave and listened for a second until they finally sang along with me. Their fathers had been the same when tiny. They enjoyed listening to some Grimm's fairy tales being read to them on tape but covered their ears in the scary bits. Then they didn't want to listen, but could not help themselves until gradually they listened all the time. All part of growing up, I imagine. I think I mentioned that I had ordered sock yarn from Michelle of Needlefood. That was earlier in the week and it arrived yesterday, nice and prompt. It was all beautifully wrapped and feels as good as it looks. Almost good enough to eat! LOL. Not only was the wool lovely, but tucked inside were some stitch markers which I use a lot. These have jump rings which are a great size for sock dpns. Some I have are really too big for small needles, so these will get lots of use. There was also a sachet to try of a wool wash, citrus scent. As I needed to buy more wool wash to wash one of my Liesl cardigans which has picked up some dirt on a sleeve, this too was very welcome. The sharp perfumes of citrus fruit are great and one of my favourites is that of lemon and neroli. Colours from left are all to do with food. Lavender infusion which is shades of lavender and purple. This one is for me. The deep red is really more scarlet and is "kitchen on fire." Then comes hokey pokey. I think some of this will turn into orange socks for young Master Finn. However, I won't mention hokeypokey and ice cream to him in the same sentence. He thinks ice cream was especially made just for him. Then there's orange butter cake which is a lovely warm colour. That may not be socks but perhaps Ysolda's beret to match the Ishbel shawl. Not that my shawl and the beret will be a match in colour. However, I really like the design of the beret, so will consider this wol for that. Lots of lovely colours and great service to match. I'm happy with this. I've been knitting but really, pictures of unblocked pieces of a little girl's ballet cardigan don't do much for me and, I imagine, not much for most people. I've been hard at work at a pale blue ballet cardigan/wrap for my eldest granddaughter's birthday in early August. I wanted to have it done beforehand without having to rush. All done now except for the last sleeve. It's been a relatively quick knit but I found it frustating. It's a Sirdar pattern and gives five different Sirdar yarn quantities. Not one of these has a length given in the pattern. This made it difficult to guess how much to buy of the Heirloom 8 ply I wanted to use. After some investigation at home using the great information at Yarndex site I worked out I needed two more balls to be able to make this. I've now written all the lengths needed on the pattern for different sizes, should be OK in the future. So back I went to Morris and Sons, yarn wrapper clutched in my hand, and was able to match the dyelot and get the extra. The first sleeve took about 1.25 balls and I have almost two balls left, so should be able to do it. If need be, I have a very similar colour I can use for joins. Another day or so, depending on my mood for knitting more pale blue stocking stitch and I'll be able to block it. When I was halfway through it, I realised I had another similar garment I should have done first. Miss Six turns into Miss Seven at the end of June. She actually has ballet lessons, so I'll do one for her. This time I'll make sure I take yarn length required when I buy the wool. Colour is a given. I asked her the other day what colors she liked now, and was told, "Still just pink." There'll still be a bit of guesswork here. Like her brother, she is tall but very skinny. I'll do the size below her age but make it longer. These two little bears are called Burundi Bears. (This is a PDF file.) They are cousins of a sort to Trauma Teddies. It's quite blowy and grey and there is occasional heavy rain here, so they are content to just look out the corner windows in my room at the wide world outside. They are particularly quick and easy to knit. In fact, I found seaming and stuffing took longer than knitting them. The bear on the left has legs longer by six rows than the pattern suggested and I think I'll add an extra stitch cast on on each arm as well. They take very little wool and are good for using up scraps. The pattern is for 8 ply, DK, but really, I think as long as needle size matched yarn, I don't think it would be much of a problem to substitute other thicknesses of wool. I'd err on the smaller size needle for any yarn so that the fabric is tight and doesn't let the stuffing show through. As these are intended for children, the ribbon bow has been securely sewn on in a couple of places. I'm going to make some more and give them to a close friend of mine who is a chaplain for the volunteer St John Ambulance organisation. We were talking the other day and he said he "dropped me in it." A friend from a Sydney brigade has been giving little knitted penguins to any children treated but she's exhausted her supply. He mentioned that I did lots of knitting but didn't quite say that I would help. However, I can take a hint. He's been a friend for years and provides a good contemporary listening ear for me when needed, so I'd like to help out. I think penguins would be cute but I have plenty of scraps for these bears which I think would possibly be quicker than penguins. They make an interesting break from acres of stocking stitch sleeves, so I'll just do them as I can and hopefully will be able to give him a bag of bears in a few weeks to pass on. I haven't done much knitting over the last couple of days. I must have been quite clumsy as I hurt the one finger three times on the one day and it's been too sore to knit with. At breakfast I picked up my muesli bowl in one hand, small coffee plunger in the other and my coffee mug with milk in that same hand - a combination I do practically every day to go from kitchen to dining room. I had my fingers curled too tightly, or something, and burnt the back of the bottom knuckle of my middle finger against the plunger. Blisters resulted from that. The other two injuries were from carelessness probably. I snipped a bit of the fleshy part when cutting nails. Obviously not watching what I was doing and the point of a very sharp Furi knife gouged a bit from the cuticle when I was making soup. All silly little things but bloody and sore too. However, I think things are improving and I'm certainly being more careful. I have an old cotton jumper which I bought from Katies, goodness knows how long ago, over ten years. It's comfortable, a good colour, gets thrown in washer and the commercial drier here and comes up well each time. I noticed in the bathroom mirror the other day that the sleeves from elbows down were wearing thin. I certainly could not wear it out of the house again like that. Today I found a part ball of some soft cotton and have made patches for it. I still can wear it only around the house, but the difference in warmth with these patches is amazing. The rest of it is fine, so hopefully I get at least this winter out of it. It's worn where I rest my arms on the desk. I decided to make some samples of textured knitting for Lynne's textured KAL. Some of these came from Knitting about.com's stitch glossary. I could have had a wider choice but limited myself to those which could be done in 18 stitches and also to those with few rows in each pattern. Some of the patterns there are not well shown and I refused to use those where the pictures were dark and unclear. Others came from the stitch glossary at Knitting Pattern Central. As you can easily see, the samplers have not been blocked. Actually, I sewed them straight onto the jumper and I can now feel the sleeves are much warmer than they had been before. Top picture, from bottom up. This is a slip honeycomb stitch, very easy. Then comes moss stitch and one called bamboo stitch is at the top. Lower picture, again from the bottom up. Brioche stitch, then fleck stitch (that's bit obvious) and at the top is a mesh like the string mesh on leather/string driving gloves. It can easily be seen that some affect the shape of the finished knitting more than others, pulling it in. One advantage of photographing them not blocked. LOL.